As many of you know I jumped on the bandwagon and took up the hobby of adult coloring books. I discovered a love for it last October and have been hooked since. I've found that coloring is calming and brings down my stress level. I have a tiered container full of gel pens, markers and colored pencils that have been used upon many coloring pages. Now the coloring craze has expanded to other merchandise besides coloring books. 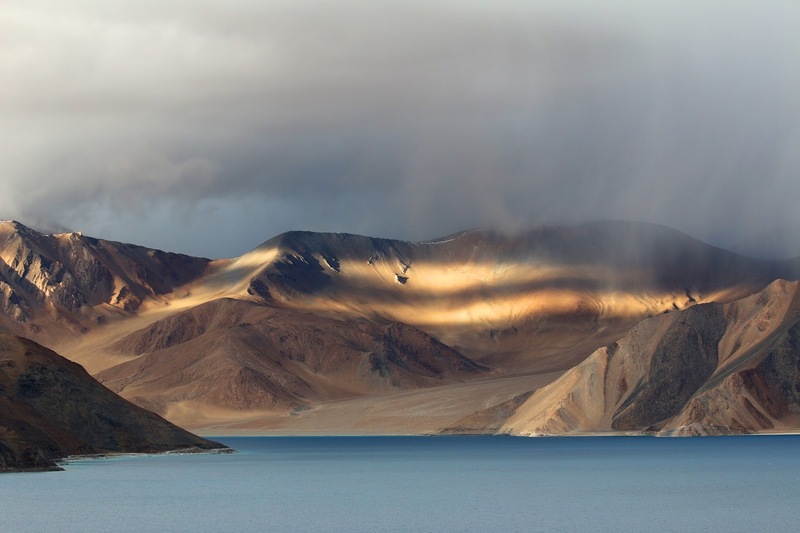 There's canvas prints, paper cups, posters and more. Which leads me to Kaleidoco Art. 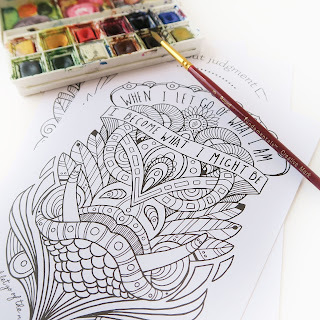 Kaleidoco Art was founded by two women and they are in the business of creating and selling 5x7 coloring cards. Drawn with exquisite designs meant to inspire creative coloring, each card includes uplifting messages and corresponding original affirmations. 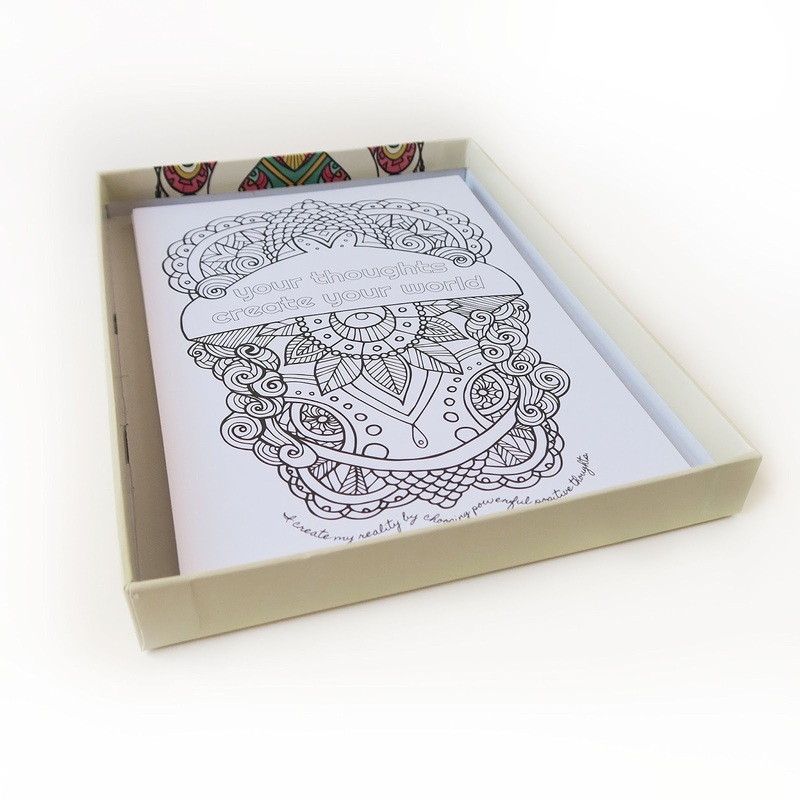 There are ten coloring cards per box, and each design is different. So, you receive ten beautifully illustrated cards and you won't have any duplicates. Each box of cards retails for $24. The cards are made with thick cardstock paper, which means I'm able to use any coloring medium on them. I colored one card with Sharpie markers and there was absolutely no bleed-through. Because the illustrations are printed on paper with quality material, I'm able to set the finished pieces throughout the house as home decor. The images are originals to the artist and have lots of detail. On each card is a positive message and affirmation. For instance, one card's message is "Your thoughts create your world." and the affirmation is "I create my reality by choosing powerful positive thoughts." I definitely recommend this set of cards to purchase as a source of relaxation, or to color and frame as gifts. 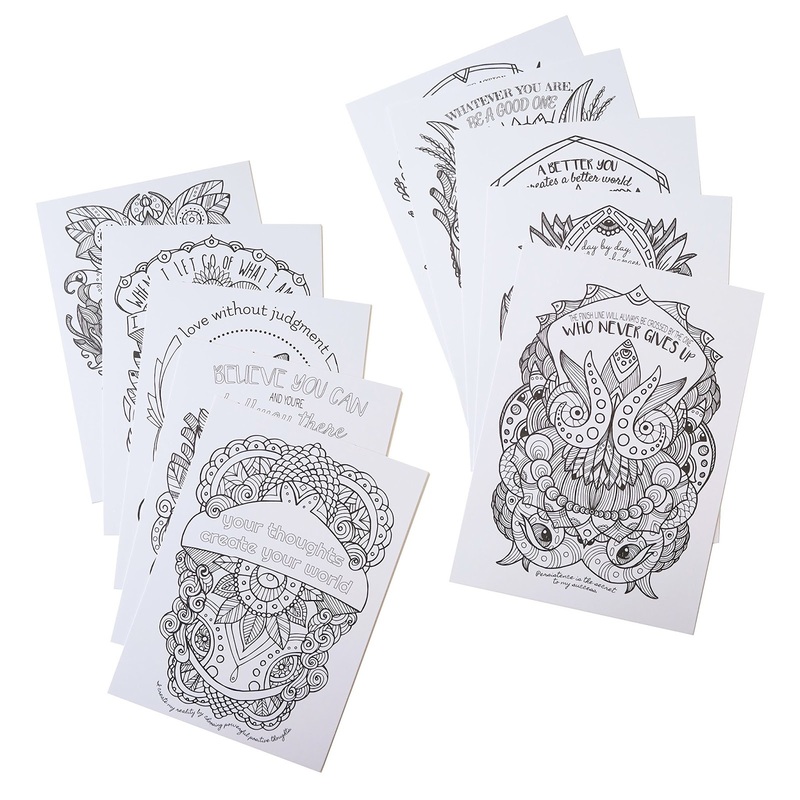 At this time, there is only one set of coloring card designs available. I'm hoping the company chooses to expand on even more designs. One person will win a box of Kaleidoco Art Inspirational Coloring Cards. 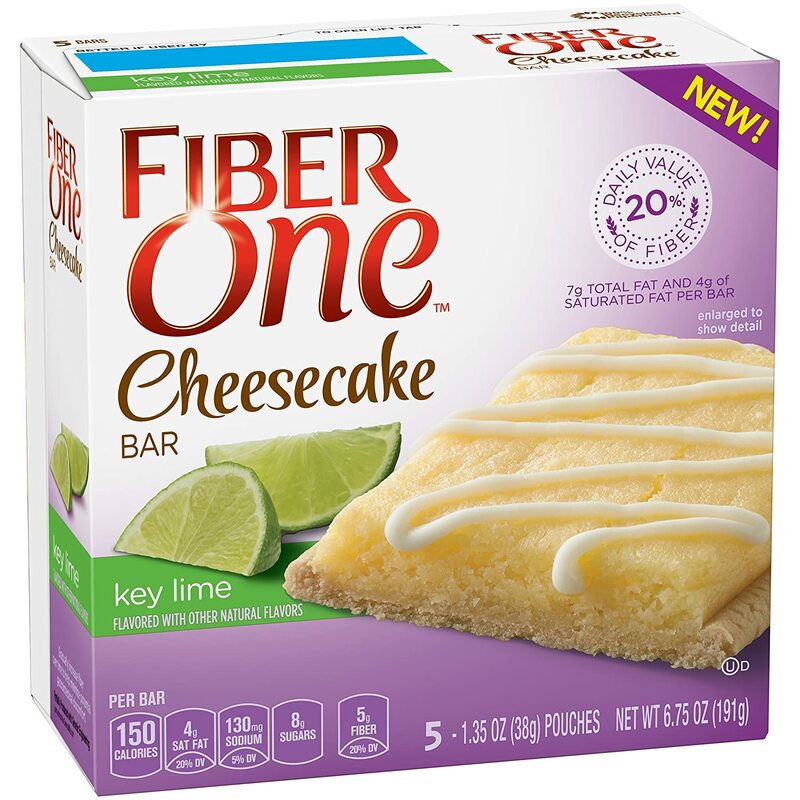 I'm not one to eat a lot of sweets or desserts, but I love me some cheesecake. And I'm not picky about what kind. My mouth's watering just thinking about it. If you're located anywhere near The Cheesecake Factory, they are offering slices of cheesecake at half price, for dine-in guests, today. 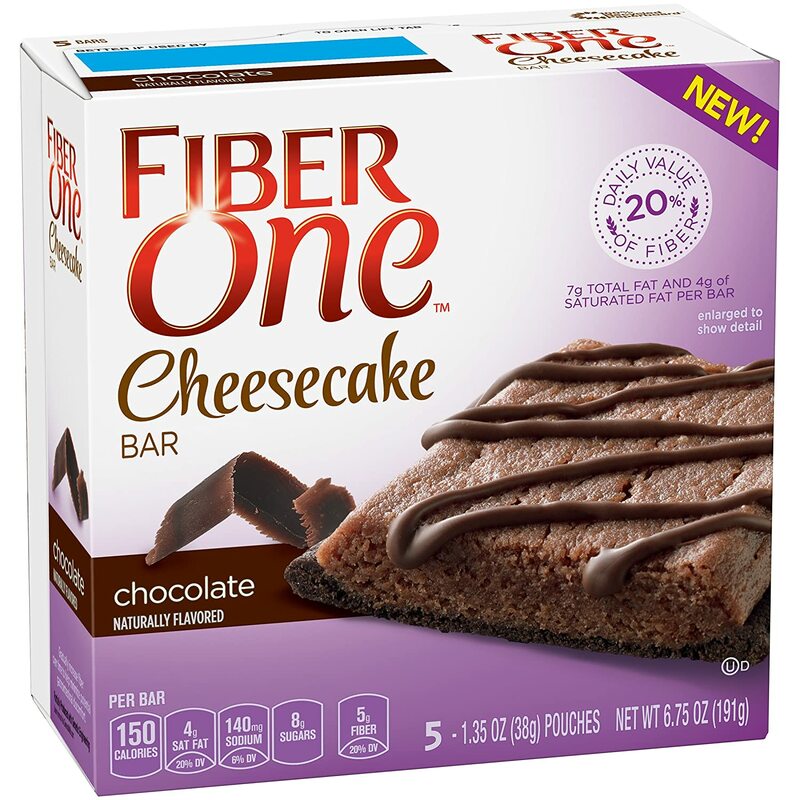 In celebration of National Cheesecake Day, treat yourself to a slice or two of this decadent dessert. I know I will be! For The Locker – A new school year can bring new worries, but don’t let your locker be one for you or your child. · Lock up your locker with the Master Lock 4400D Indoor Bluetooth Padlock which turns your phone or any Bluetooth-enabled device into a key. 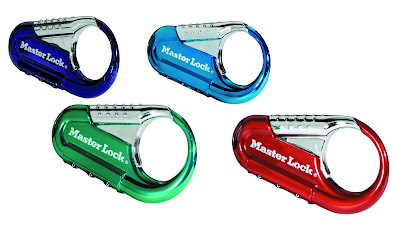 · Equally innovative, the 1500iD Speed Dial Set-Your-Own Combination Lock opens with a combination of directional movements, is easy to use and comes in four vibrant color options (red, purple, blue and black). Perfect for younger kids who don’t have Smartphones yet! For The Backpack – Your child’s backpack may include important school documents, personal information, homework and valuable items, such as smartphones, laptops, tablets and money. It is important to ensure protection if items are left unattended. 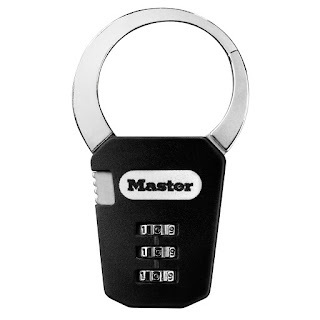 · Master Lock 1550DAST Backpack Lock or Master Lock 1548DCM Set Your Own Combination Padlock creates an added layer of protection that will help deter possible theft and give you and your child one less thing to worry about. For The College-Goers – For those living on college campuses, it is necessary to take the extra safety precautions to ensure that your valuables are safe and secure. 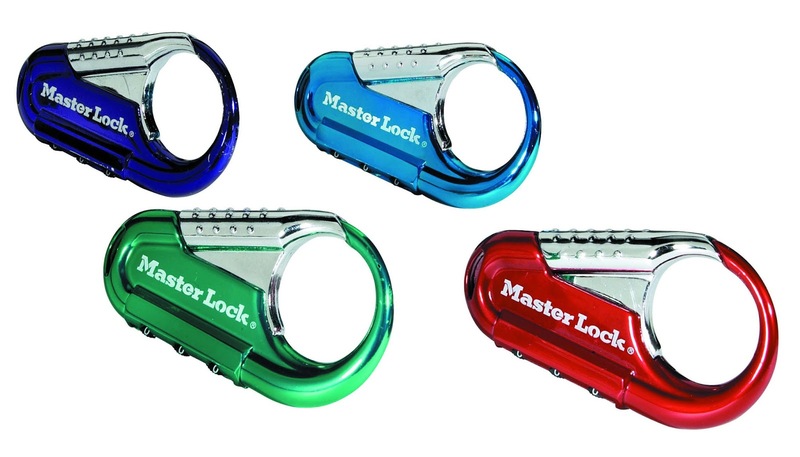 · Master Lock 5900D SafeSpace keeps your cell phone, money, keys, jewelry, credit cards or other small valuables secure while on campus or away from your belongings. · SentrySafe PL048E Portable Laptop Safe is perfect for those who are living in a dorm or apartment for the added security for your laptop when you are not there. One person will win a Master Lock 1550DAST Backpack Lock and a Master Lock 1548DCM Set Your Own Combination Padlock. Flaunt your favorite color and pucker up. It's National Lipstick Day! Whether dark and bright or sheer and light, it's a day to show off your favorite shade. I wear makeup almost everyday, but only wear lipstick every now and again. It's mainly because there's only a couple of brands that I know won't smudge. There's almost nothing worse than having the color transfer to your teeth or to a cup. Do you frequently wear lipstick? What's your favorite color or shade? 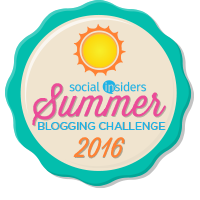 As part of Week 2 of the Social Insiders Summer Blogging Challenge, I get to tell you about my favorite thing. What?! I'm only supposed to talk about one thing. I have several favorite things. It all depends on what category I put them in. Pepsi, it's my favorite soda. And the Bible is my favorite book. Hugh Laurie totally rocks as my favorite celebrity. But, since I have to pick just one thing, I'll go with the first thing that came to mind. And that, my friends, is the Mr. Clean Magic Eraser. 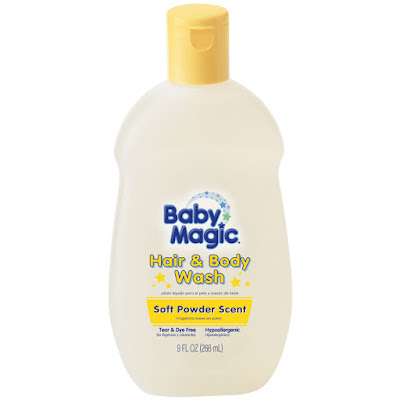 I always keep Mr. Clean Magic Erasers in stock. The "magic" is in the name for a reason. 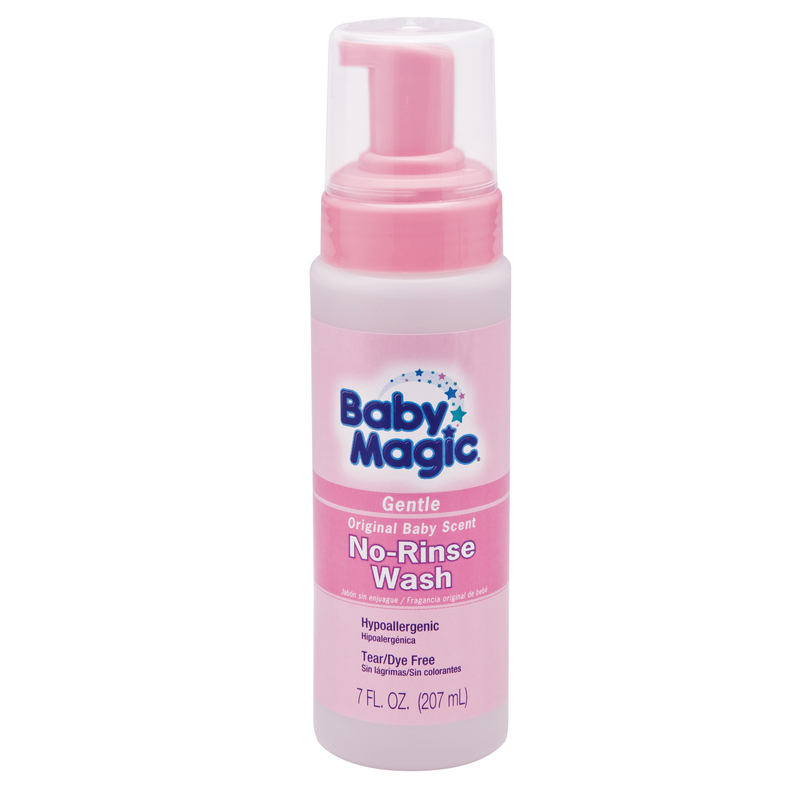 It gets rid of markings and smudges that other cleaners and cloths can't. Are you a fan of the Mr. Clean Magic Eraser too? 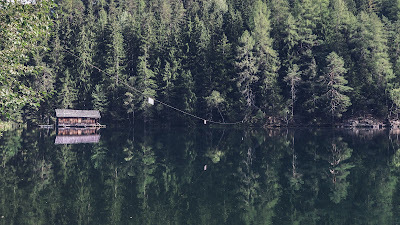 What's one of your all-time favorite things? I've been a blogger for seven years now and for several of those years I've been a member of Social Insiders (formally known as Purex Insiders). 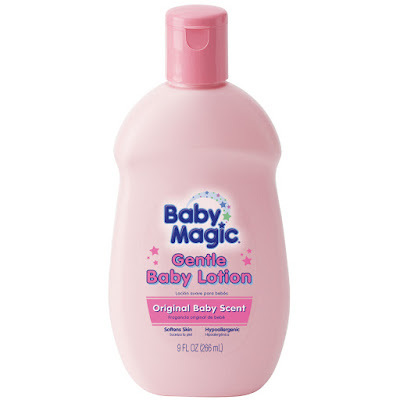 Because of the partnership with them, I've received several products to review and have been able to host giveaways. Just a few brands they represent are Purex, Dial, and Renuzit. It's not often that I have creme brulee, but I sure know how to scarf some down when I do. For those not in the know, creme brulee is a dessert that consists of a rich custard base that is topped with a contrasting layer of hard caramel and served at room temperature. 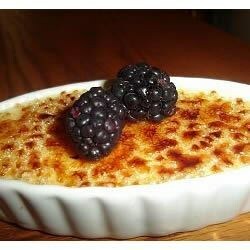 In celebration of its day, here's a recipe for Creme Brulee (found at allrecipes). Preheat oven to 300 degrees F (150 degrees C). Beat egg yolks, 4 tablespoons white sugar and vanilla extract in a mixing bowl until thick and creamy. Pour cream into a saucepan and stir over low heat until it almost comes to boil. Remove the cream from heat immediately. Stir cream into the egg yolk mixture; beat until combined. Pour cream mixture into the top pan of a double boiler. Stir over simmering water until mixture lightly coats the back of a spoon, about 3 minutes. Remove mixture from heat immediately and pour into a shallow heat-proof dish. Bake in preheated oven for 30 minutes. Remove from oven and cool to room temperature. 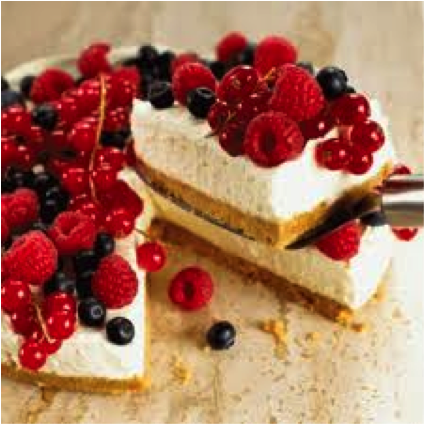 Refrigerate for at least 1 hour or overnight. Preheat oven to broil. In a small bowl combine remaining 2 tablespoons white sugar and brown sugar. Sift this mixture evenly over custard. Place dish under broiler until sugar melts, about 2 minutes. Watch carefully so as not to burn. Remove from heat and allow to cool. Refrigerate until custard is set again. I've been working as a 911 Dispatcher for almost twelve years now. It's a very demanding, yet rewarding, job. 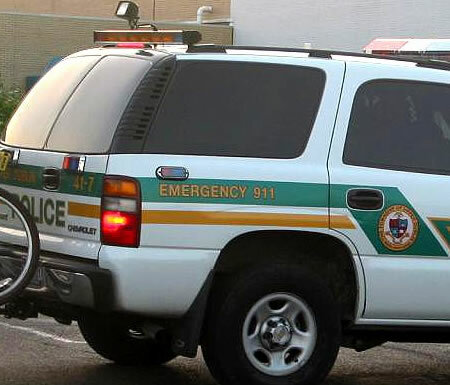 In my employment I'm responsible, among many other things, for dispatching police, fire, sheriff, and ambulance agencies. 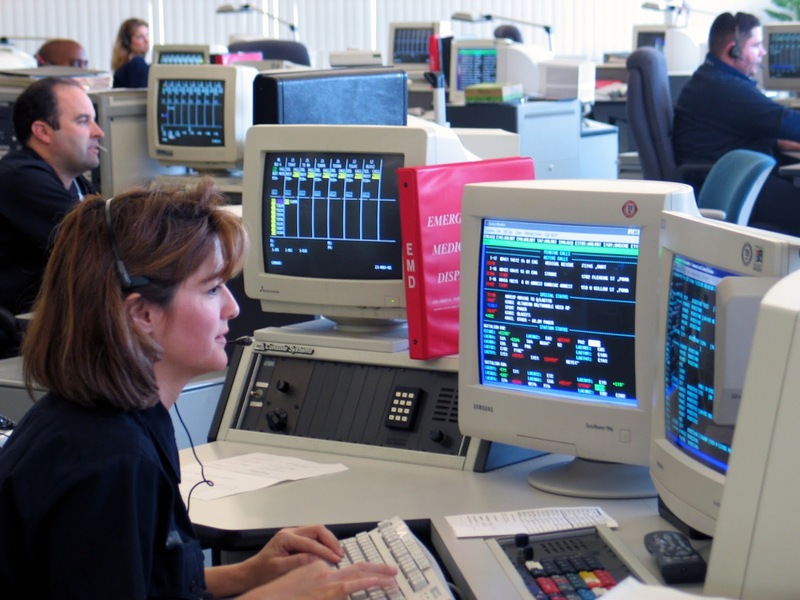 I'm also responsible for taking calls from the public and screening them for what emergency has occurred. Although most people rely on cell phones when calling 911, I can personally vouch that it's not always a surefire way to communicate during emergencies. In the spirit of keeping you and your family safe, I recently partnered with Ooma - leading Internet home phone service with reliable E911 technology—to deliver three tips for keeping your home safe this summer in addition to owning a landline. You can check out Ooma on their website, follow Ooma on Twitter, or visit the Ooma Facebook page for more information. TIP #2: WRITE AN EMERGENCY CONTACT LIST Make sure that no matter where you are, it's easy for the people around you to call your emergency contacts. Consider posting your own number, as well as first response numbers, on your fridge so your kids know how to reach you and your family, family members who live close by, or the authorities. Post the name and number of a trusted friend or neighbor, too. With Ooma's home phone system, up to three of these contacts can be notified by text message automatically when a 911 call is placed. In situations when every second counts, this reliable Internet-based technology could save tens of thousands of lives. TIP #3: RECOGNIZE THE FIRST SIGNS OF DANGER Educate your kids about the sights, smells, and sounds of danger. If they hear a smoke alarm or see an appliance overheating, advise your children to get outside as quickly as possible. 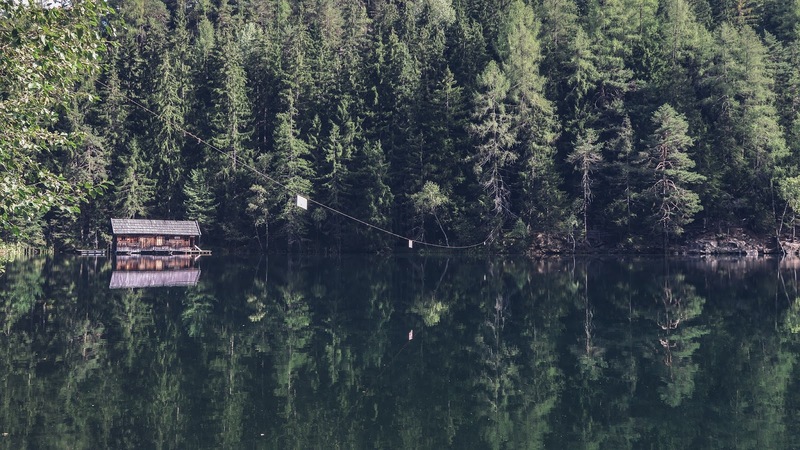 Planning an exit strategy is key to getting a safe distance away from the house so you can alert a neighbor and have them call the fire department. Consider making a detailed fire plan with multiple escape routes and keeping a printed copy of your fire plan on visible walls around your house. Got any 911 emergency stories of your own? Do you own a landline or rely solely on a cell phone? 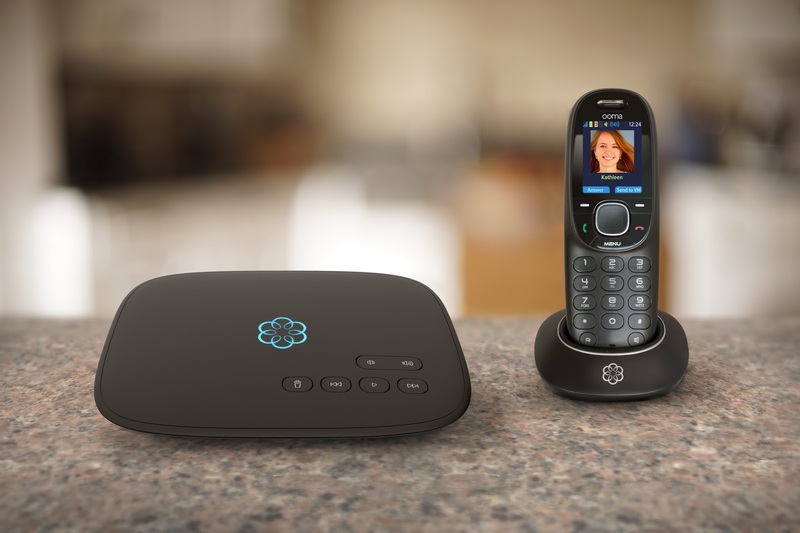 What are your thoughts on the Ooma home phone service? It's been a few weeks since I've joined up with Stacy Uncorked for Random Tuesday Thoughts. This week, I'm back in the game. This past couple of weeks we've either been eating out at restaurants, or grilling food and entertaining at home. I took Logan to Chicks on the River for his birthday. 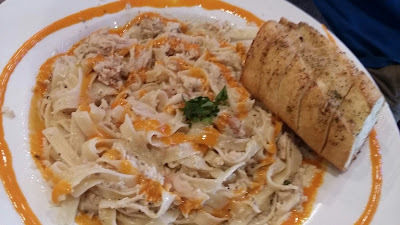 We dined on Fettuccine Alfredo and garlic bread. The food was alright. Not bad, but not great. For Emma's birthday we went to Golden Corral. That particular restaurant opened up less than a month ago. We were packed in like sardines but I thought the food options were great. Although, I won't be taking Emma there again anytime soon. She dined on a strawberry, a cookie and a piece of chicken. Not bad, unless you're paying $13 for it. Which I did. Me and Logan also dined out for the first time at Hyvee Market Grille. 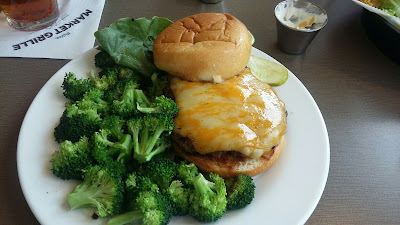 I had a Colby Jack cheeseburger with steamed broccoli. It was delicious and I'd dine there again. And because we hadn't already been to enough eateries, I went with Logan and Adam to Mi Jalapeno, a local Mexican restaurant, this week. Their food is always awesome and I've never found anything I don't like. Friday evening I went with a gal pal to Blues in the District. It's a free event in the park that goes on every month in the summer. A different Blues band plays every time. That kind of music isn't my thing but I enjoy the atmosphere. Saturday our Small Group got together and volunteered at a local food pantry. My particular role involved stocking and bagging personal and hygiene items. To show our appreciation for our Small Group's help, Jason and I hosted a feast in our home on Sunday. Jason smoked a ham while I whipped up some pasta salads and other foods. As you can see, we've been keeping quite busy. How have you been? What randomness do you have to share? Do you enjoy listening to Blues music? What are some of your favorite restaurants to dine at? The winner of the Finlandia Cheese and Butter giveaway is #66, Eloise Carlson. The winner of the Finding Dory Fun on the Go Activity Set giveaway is #46, Kim Reid. The winner of the Finding Dory Design A Vinyl giveaway is #46, kathy pease. 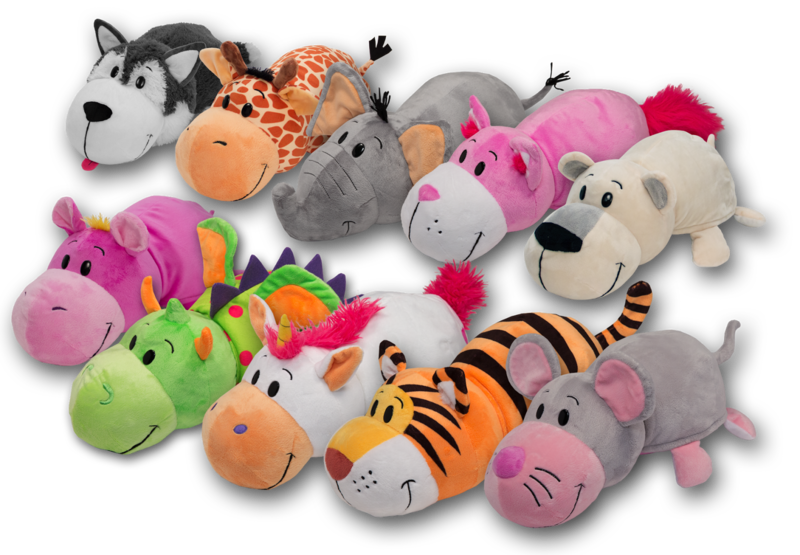 The winner of the FlipaZoo giveaway is #99, Russ1934. I have great respect and huge admiration for my uncles and a couple of aunts. Unfortunately, I don't get to see them very often. When I do, it's cherished memories that I treasure. Although they are not Amish, they mostly play the part. They are very old-fashioned in their ways. I can't speak highly enough of my three uncles on my mom's side. They are some of the most talented and caring men I know. I could gush on and on about how wonderful they are but I'll keep it at bay. I also have an aunt, but her lifestyle is one that I don't care to partake in. I didn't know any aunts or uncles from my father's side and I'm not even sure if any are still alive. In addition to having the greatest uncles in the world, I'm blessed to be an aunt and great-aunt to several kids. One niece was even named after me. Are you close to any of your uncles and aunts? Are you an uncle or aunt yourself? 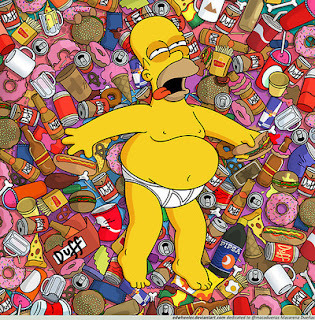 Junk food is defined to be high in calories, fats, sugar, or salt. It has little or no nutritional value. And I eat my fair share of it! I actually consume very little chocolates or sweets, but I sure do love some good ole' fried foods. And, although it's not a food, I am somewhat addicted to soda. Pepsi and Mt. Dew get me every time. 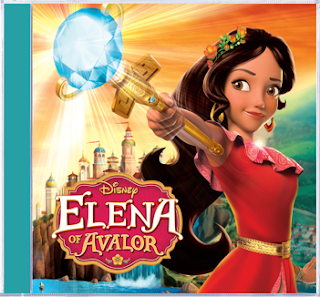 Walt Disney Records announces the Elena of Avalor soundtrack EP available July 22. The EP features 7 songs from the highly anticipated Disney Channel animated series “Elena of Avalor” which premieres July 22 (7:00-8:00 p.m., EDT). The theme song “Elena of Avalor” is performed by Gaby Moreno and Elena's anthem "My Time" is performed by Aimee Carrero, the voice of Princess Elena. In addition to singing the theme song, Gaby Moreno will also voice a guest role in the series. Born in Guatemala, Moreno performs her music, which ranges from blues to jazz to soul to R&B, in both English and Spanish. In addition to winning the Latin Grammy Award for Best New Artist in 2013, Moreno was nominated for an Emmy® Award for Outstanding Main Title Theme Music in 2010 for co-writing the theme song to "Parks and Recreation." Set in the enchanted fairytale land of Avalor, the series tells the story of Elena, a brave and adventurous teenager who has saved her kingdom from an evil sorceress and must now learn to rule as crown princess until she is old enough to be queen. 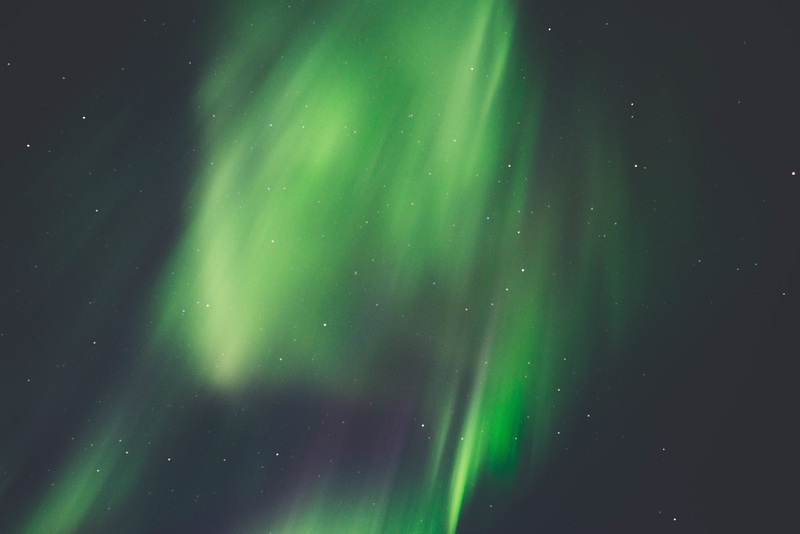 Elena's journey will lead her to understand that her new role requires thoughtfulness, resilience and compassion, the traits of all truly great leaders. and wherever music is sold. One person will win an Elena of Avalor Soundtrack CD. 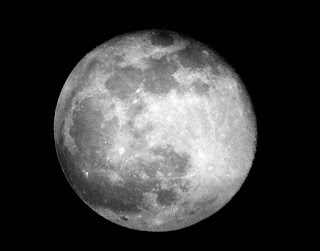 Don't pull your pants down just yet.....it's not that kind of "moon". Today is National Moon Day, to commemorate the day man first walked on the moon in 1969. Americans Neil Armstrong and Buzz Aldrin are the ones who made that history happen. Kudos to them! Did you watch the live TV broadcast when it aired in 1969? It's a National Day that's only been in existence for a short time, but it's one worth celebrating. And that day is National Hamiltons Day. The Registrar at National Day Calendar approved National Hamiltons Day just this year, and it's in conjunction with TGI Fridays. If you are in the mood for a good deal on food, stop by a TGI Fridays location today. Fridays is offering guests their favorite Summer Grill entrées – including a full rack of ribs – for just $10. There's also a choice of chicken and mahi mahi at that price. Join the #FridaysRibolution by visiting participating TGI Fridays locations to feast on delicious foods, without breaking the bank. Will you be celebrating National Hamiltons Day at TGI Fridays? I would if I could but our Friday's shut down unexpectedly a little over a year ago. No rhyme or reason. Guess I'll have to munch on some Sour Candy, since today's also a national day for that kind of candy. You can't go wrong with a side order of fries, especially on their national day of recognition. So be sure to eat a few or two. 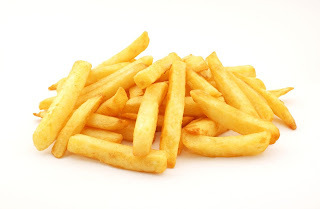 French fries come in many shapes, sizes and forms. I like mine slightly crispy and a little fat. I usually sprinkle salt on them but always skip the ketchup. What's your favorite kind of fries? Finding Dory, out in theaters, is sure to be one of the summer's top movies! Calendars.com has a variety of summer fun items sure to please Dory fans, with one of those being the Finding Dory Color N Style Purse. The purse, shaped like a fish, can be decorated to a child's choosing. It includes four permanent markers and twelve small, round gems. The marker colors are blue, orange, yellow, and green. The material the purse is made of allows children to easily color it as they like, with no smudging. The gems have a sticky backing for placement on the purse. The inside of the purse will hold several small trinkets. It's great because it allows children use of their imagination and it's something that can be used to carry children's treasures. With the film being so popular, companies are either making or selling merchandise that fit with the Finding Dory theme. Calendars.com is one of those companies. Don't let the web name alone fool you. Calendars.com is a fantastic place to shop for calendars but it's also got quite the selection of puzzles, books, games, toys and gifts of many themes. One person will win a Finding Dory Color N Style Purse. We've moved from one location to another. Found a nicer rental home on the other side of town. Our 4th of July weekend was largely spent on moving. We had amazing help with the move. Had over ten friends come and haul stuff from one place to another. Made the transition so much easier. I made the realization that I must downsize some more. We went from a fairly large house to a much smaller one. You don't know how much you own until you have to move it. I've been in Super Beast mode and have gotten most stuff put away. Pat on the back for how much I've gotten accomplished in just one week. It's ironic that I live in a smaller space and our weekly Small Group has exploded from 10 people to 14 people. We're practically sitting on top of each other. It's a good problem to have, though. Because we were busy moving, we didn't do much for 4th of July weekend. We did make it out to a friend's house that Friday night for a cookout and fireworks. They put on quite the fireworks show. Big bangs and big booms. On 4th of July, during the day, we went to a Truck and Tractor Pull show at the fairgrounds. My husband and one of my teen boys bought pullin' mowers and plan on competing once they get the mowers modified. Boys and their toys! I won a nice charcoal grill from a local grocery store promotion. I picked it up the other day, after I checked my voice mails and realized they'd been trying to contact me. I'm horrible about not checking VMs until several days after the fact. I 'bout lost out on the win because of it. I took my oldest daughter to the movies the other day. We watched The Purge: Election Year. It was okay. Not great, but I've seen worse. I'm no screenwriter but I think the whole Purge concept could be played out much better in film than it has been. Have you jumped on the Pokemon Go bandwagon? For those not in the know, it's the most popular app right now. So much so that the server crashes several times because of how many people are playing. I don't know much about it but, in a nutshell, it's an app that allows you to catch virtual Pokemon. Seems it's taken the world by storm. Shelby and Logan have taken it pretty seriously and have been on several hunts. "Oh, ya know, just hangin' out with my Pokemon pal"
I took Shelby to yard sales Saturday and it gave her prime excuse to hunt for those virtual Japanese characters. Nothing like having to "just hang on" because another Pokemon has been spotted. There could be worse things the kids are doing, I suppose. Emma's 14th birthday was yesterday. And Logan will be 18 (an adult!) in just a couple of days. My babies aren't babies anymore. No parties are planned. We're going to take them out to eat at a nice restaurant over the weekend. So, what's been going on in your part of the world? Have you downloaded the new Pokemon Go app? Have you seen any of the three The Purge movies? It's not often that I get to check out a 7-Eleven location. There's very few of them in my area. But, for those who are near the chain, you might wanna head there today. July 11 is the day that 7-Eleven convenience stores reserve special deals for their customers. And since this year is the Slurpee’s 50th birthday, it’s an extra special year. Watch for promotions at your local 7-Eleven, including the promotion for a free small Slurpee from 11 am to 7 pm. Will you be going in to 7-Eleven today to celebrate and get in on some specials?